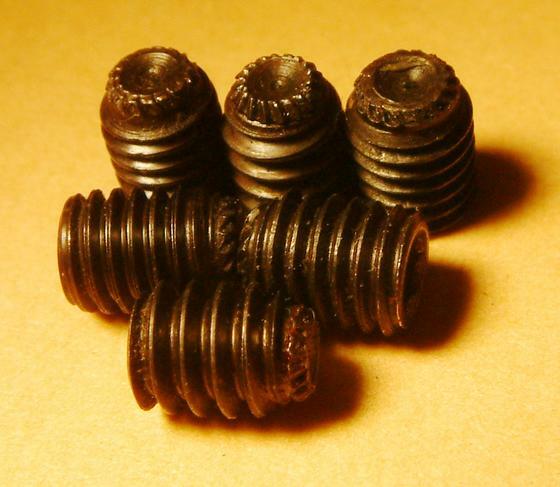 The TU56 DECtape hubs have knurled cup set screws which mine were worn. The manual recommends replacing them any time you remove a hub. If they slip they wear down and leave groves in the motor shaft. You can see some of them are quite worn. McMASTER-CARR sells suitable replacements. If you look in the picture you will see that the set screws had two different thread pitches. They appeared to be 10-24 and 10-32 in 1/4" long. A couple of the screws were stripped but in the hubs which had 4 screws so I didn't have to fix them. It is unclear if the wrong screws were installed in the past or they did use two different types. Some of the hubs only had 2 screws. Watch out, the plastic they are in is soft so don't get too aggressive tightening the screws. Also read the TU56 maintenance manual on alignment of the hubs. They should have a clearance of .017"